Las Vegas, NV (January 22 to 25, 2019): The 2019 SHOT Show is an annual event held at the Sands Expo and Convention Center in Las Vegas. Thousands of gun enthusiasts, law enforcement, media and important industry exhibitors gather to network and highlight their new and exciting products for 2019. In that light, this review of the 2019 SHOT Show will elaborate on the following topics: 1. New 2019 CCWs (Carry Concealed Weapons) introduced and 2. 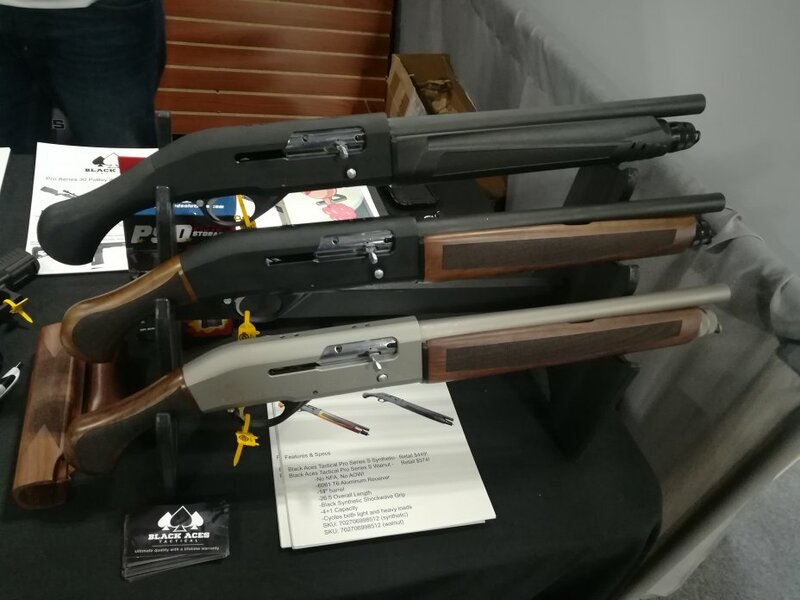 New 2019 Guns and Shotguns. First, the new CCWs: 1. KIMBER K6s Revolvers (K6s DASA 2", K6s TLE 2", K6s TLE 3") and KIMBER Evo SP (CDP, TLE and Two-Tone); 2. SIG SAUER P938 (Legion, Spartan II): a 1911 inspired 9mm and the SIG SAUER P238 (Legion, Spartan II): a 1911 inspired all metal chambered firearm in .380ACP; 3. BOND ARMS BULLPUP: ultra-compact 9mm with a unique reverse feed design, 3.35 inch barrel, DAO trigger only weighing 18.5 ounces with an MSRP of $1099.00; 4. GLOCK 26 and 34 Generation 5: improved accuracy, durability, performance, control and flexibitility. Second, the new Shotguns: 1. BLACK ACES TACTICAL: Shockwave Semiautomatic 12 Gauge, T6 Aluminum receiver, 14" barrel, 4+1 Capacity, cycles both light and heavy loads, MSRP Synthetic $449.00/Walnut $574.00; 2. CHIAPPA Honcho Triple Barrel, 12 Gauge Semiautomatic, 14" barrel, 5+1 Capacity; 3. STANDARD MANUFACTURING SKO Mini: 12 Gauge, Semiautomatic, 14.75" barrel, MSRP: $699.00; 4. REMINGTON V3 TAC-13: all new 12 gauge, recoils like a 20 Gauge, V3 autoloading platform, Shockwave Raptor pistol grip, 13" barrel, 5+1 capacity, MSRP: $915.00 and finally, 5. FULL CONCEAL M3D-P80 dual folding 9mm CAA USA Viper stabilizing arm brace for the Generation 4 GLOCK 19: From 4 components to 1 component for full conceal, Viper: footprints like a laptop, holds 21 to 33 rounds and collapsible with magazine. (All texts and photographs by Rene Zamora, Photographer/Journalist, Newsmexx TV, Henderson, Nevada USA).